Your album S.O.B was released in 2007? Correct? Actually S.O.B. was release in 2003. It was a European version from V.S.F., a Brazilian version released in 2001. A French label asked us to record some tunes in English, so we translated some songs from V.S.F. and put 3 new tunes in S.O.B. What was the opportunity and the process that you participated in the festival? It was so cool, we could play with some bands we love. We could see some awesome bands and still split the stage with them. I just hope we can have another opportunity to play in some cool festi val. Who is a composer and a songwriter? 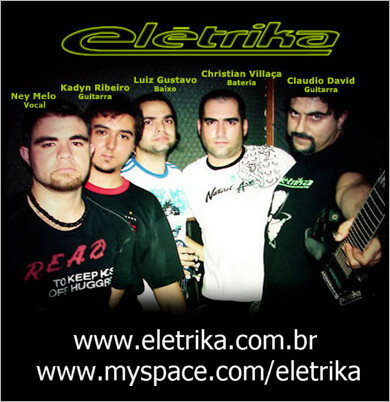 In EletriKa almost everybody make songs and write words. Even in the next CD we will have songs made with our first formation. I composed songs and lyrics in all of our CD, but Willi, Daniel, Rogerio, Marcelo and Charlis did too. Where can people from outside in Brazil get S.O.B.? The Label which released S.O.B. closed, so we are trying to put out a new version of it called "v3.1 beta". We are re-recording some tunes now and will include Zombie Factory an unreleased. There is a new label in the USA which wants to release it, so, if everything goes OK, we will put v3.1beta out soon. I hope we can get some distribution in the other countries, including Brazil, where S.O.B. was　no released. What do you think that your album come out in Japan? I hope we can get some kind of distribution over there, it would be a honor for us. For now, people in Japan can listen to our tunes on our MySpace. We even put some tunes to free download. If you can give your address. Music video I Gotta is great! Do you have any plan for a new video? Thanks a lot, I'm glad you liked it. Yes, we are planing to make the Zombie Factory video. What are you doing now? Some gigs in Brazil? Or in other country? Now we are re-recording some new tunes to go in the American v3.1beta. Here in Brazil we do not have too many places to play now-adays. We have a lot of bangers but we don't have support to Metal bands now. Do you have any plan for coming to Japan to play? I'm afraid we need to get some distribution over there before we could go to play in Japan. Hopefully, soon!